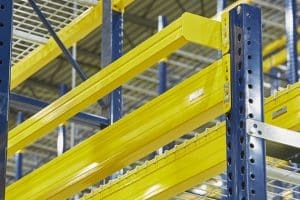 Pallet rack damage can be extremely costly and dangerous. Damaged racks are more likely to collapse or spill their loads, potentially causing injury and inventory loss. Steel King® offers a wide variety of products to guard your rack system against impact and to keep workers and product safe. It’s inevitable in a busy operation that a forklift will eventually hit your rack upright. And while it may not require immediate replacement, the rack capacity will be compromised and may collapse if it is overloaded or loaded incorrectly. 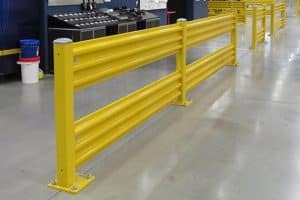 Steel Guard rails can be installed in this role for as much or as little vertical protection as you need. 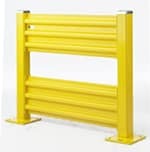 These are the same guardrail systems you might install around an in-plant office or along a production line, and are frequently used in rack protection applications due to their versatility and high visibility. Specialized rack-end guards that are built to guard a standard 42″ deep rack aren’t as visible as a larger rail, but they’re still highly visable. You install two for a double row. Unlike other guard rails, Steel King’s Guard Dawg wraps around the front column to provide front impact protection. They can be specified for just about any rack depth and let you protect the front and sides of a rack row in one installation. 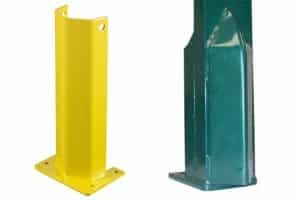 Mounted on the floor in front of each upright, these are the most popular – and highly effective – rack column protectors. 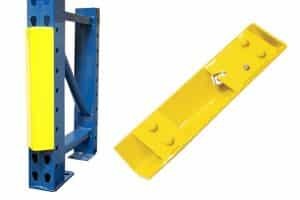 These types of rack protectors are extremely common and effective for situations like a forklift backing into an upright, or hitting it while loading or unloading. 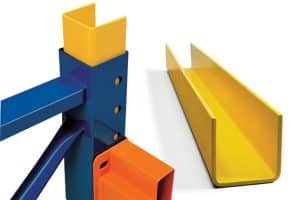 They’re finished safety yellow and are easy to install or move when needed. They are either 12″ or 18″ high, and are specifically built to protect the most vulnerable part of a rack frame — the base plate and lower leg. They’re economical and durable and much easier and faster to replace than an entire upright. These heavy-duty reinforcements are welded directly to the upright during the manufacturing process. They can be ordered to customs lengths to offer protection beyond 18″ height. These snap-on protectors offer solid steel to help deflect impact. They are attached to the rack’s teardrop holes and snap into place. They can be installed where rack impact is most common – at floor level or higher on the rack face. They can easily be removed, reinstalled or replaced at need. 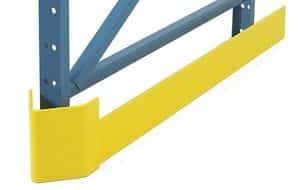 Pallet load stop beams are designed to prevent pallets of product from being accidentally pushed off the back of a rack. Pallet safety stops also create an acceptable flue space opening between pallets, allowing for ventilation and space for fire suppression sprinklers above the racks to penetrate product stored in racks. Add protection right from the start – just as high as you need it with Column Core inserts for SK2000® roll form rack. Inserts strengthen the most vulnerable section of your rack frame by 5X their already sturdy frame.